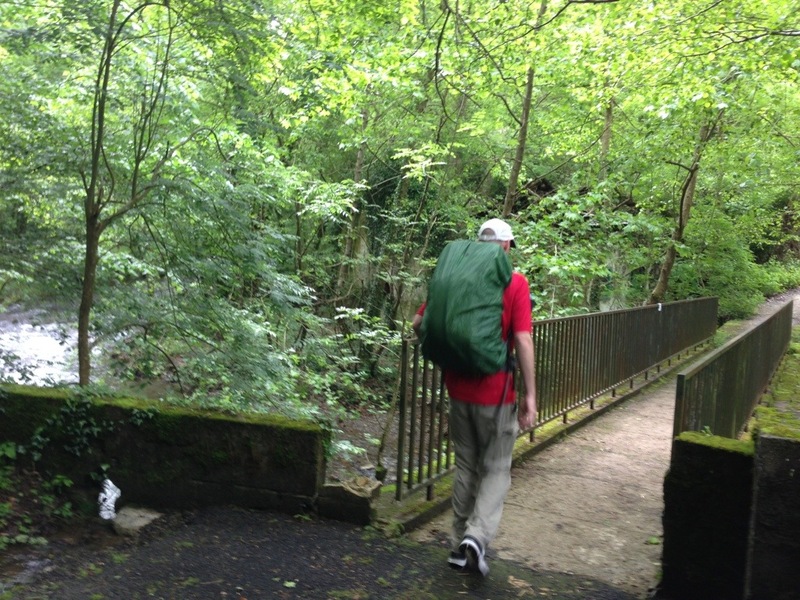 Today we walked 7.2 miles (11.6 km). We had a simple breakfast (bread, cheese, jam, etc.) at the B&B and then headed out the door. 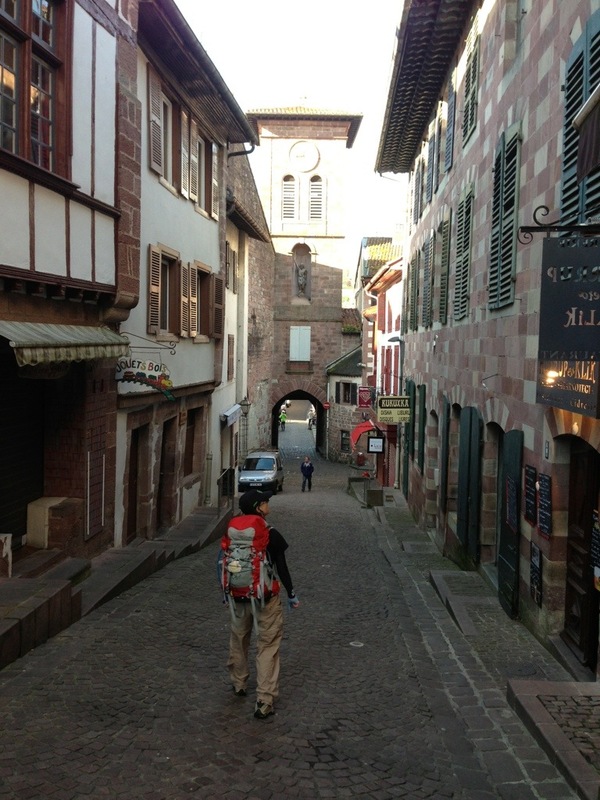 Even though we were getting a late start, the town was really quiet as we walked back down the hill and over the river to the south end of town. It was a chilly 47 degrees F (8 C) but it warmed up quickly and thankfully we only had a few drops of rain throughout the day. Important turn-off away from the highway. Remember the white poles with red stripes. 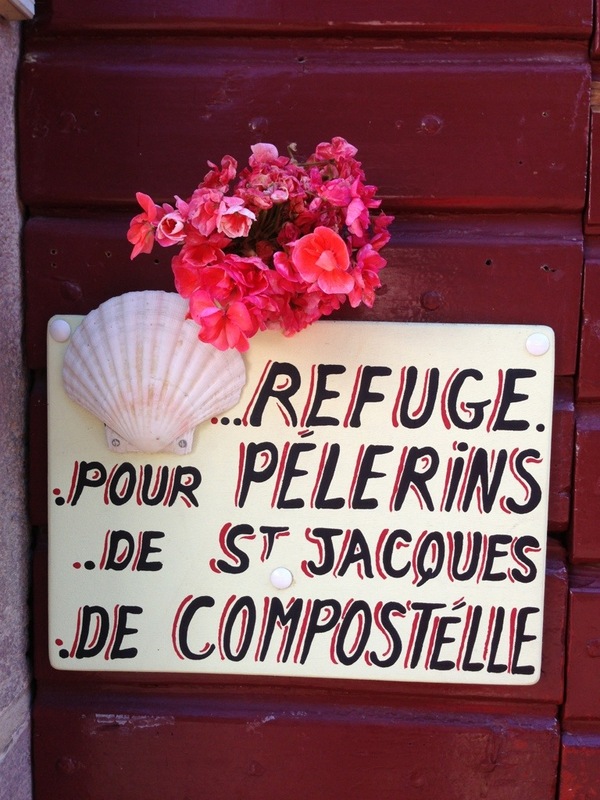 Note the new scallop shells that we got from the pilgrims’ office in SJPdP — now firmly affixed to our packs. 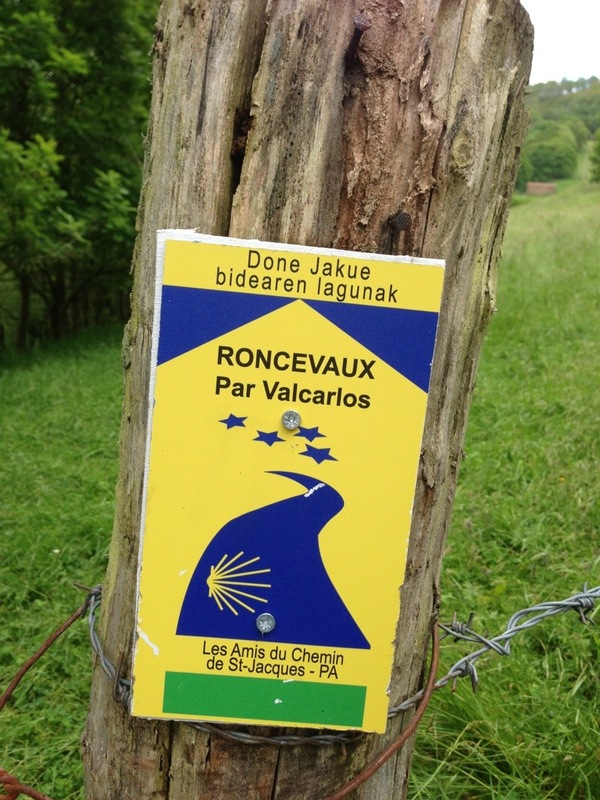 “Roncesvalles via Valcarlos” — These French waymarkers seem to be what are used for this part of the Camino instead of painted yellow arrows, which I’m sure we’ll be seeing soon. 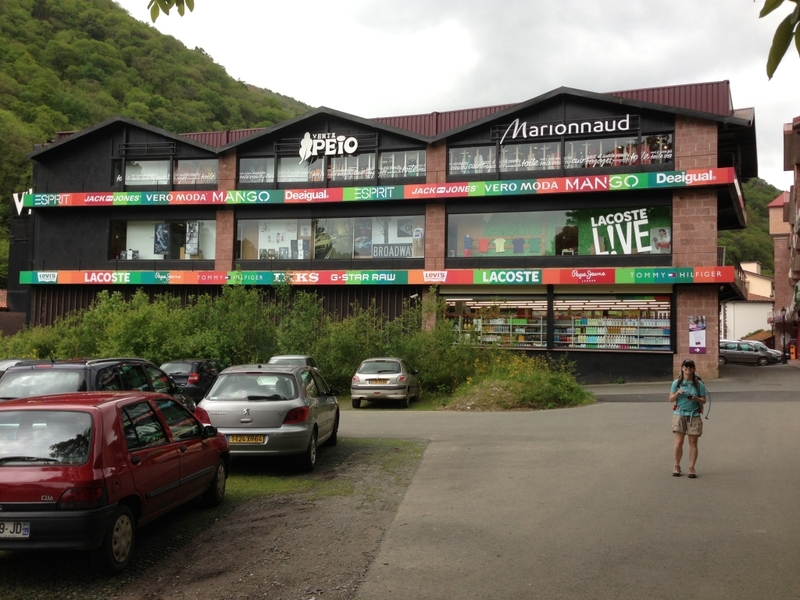 Highway rest stop at the French/Spanish border, including a supermarket and cafe. Walk through but don’t turn left over the bridge. There’s a marked path at the back, behind the gas station. 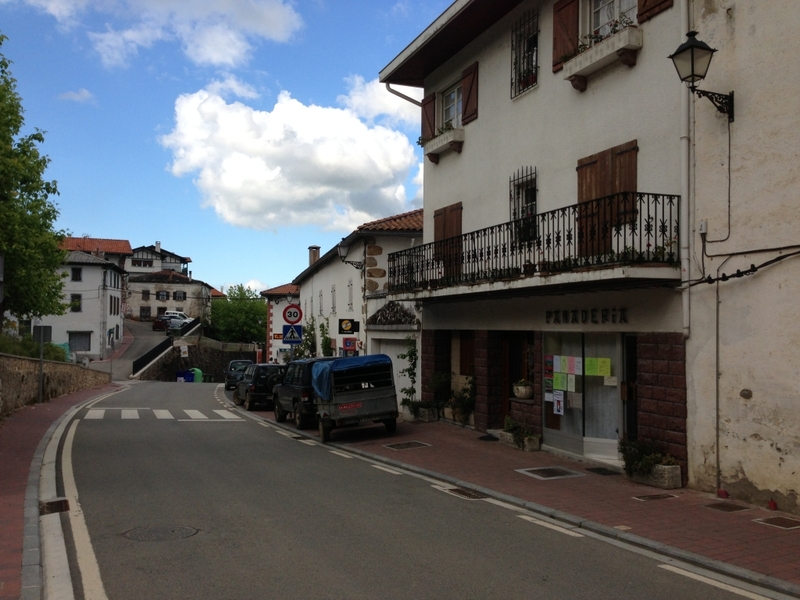 The albergue in Valcarlos. 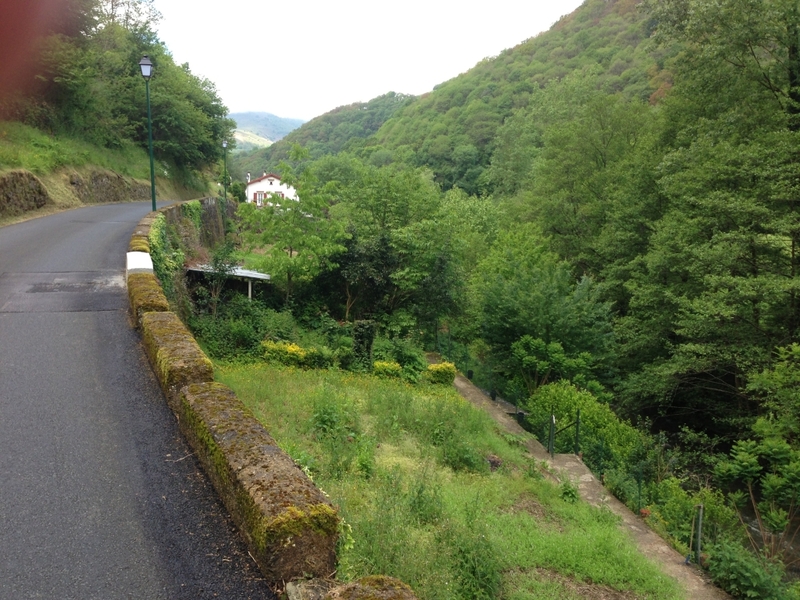 When you finally get to the top of the hill, it’s the first building on the right before you get to the main road that runs through Valcarlos. Take the ceramic steps down the right side of the building to a metal door with a combination lock. If you’re the first to arrive, go back up and continue to the main road, turn right, and ask for the key at the Bar on the left. The bar is also a good place to eat. 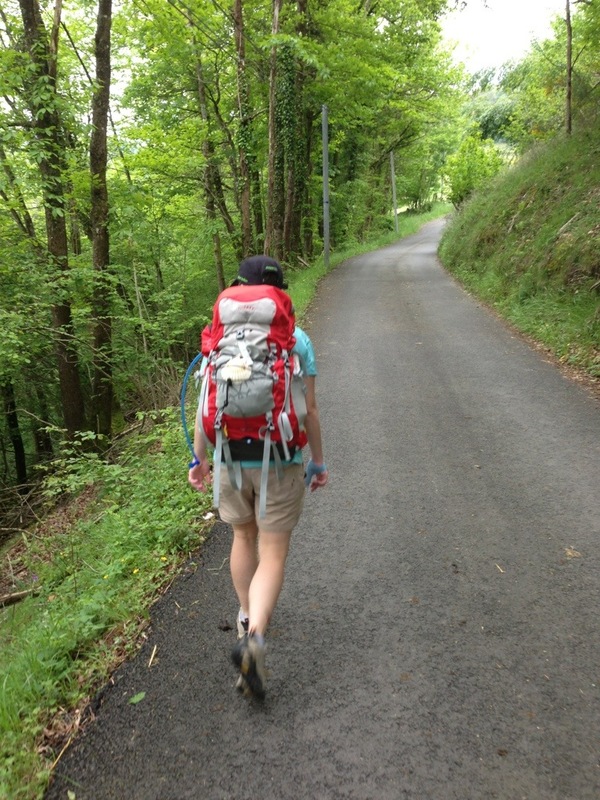 Today we walked over generally easy but sometimes very steep terrain, usually on paved roads away from the main road. 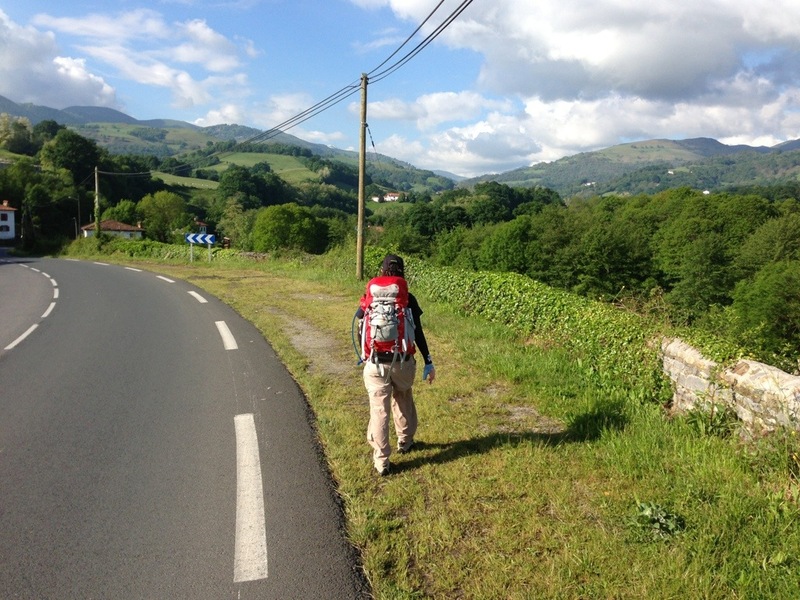 We crossed back and forth over the Spanish-French border a couple of times, without so much as a signpost indicating the change in countries. But we’re in Spain for good now. 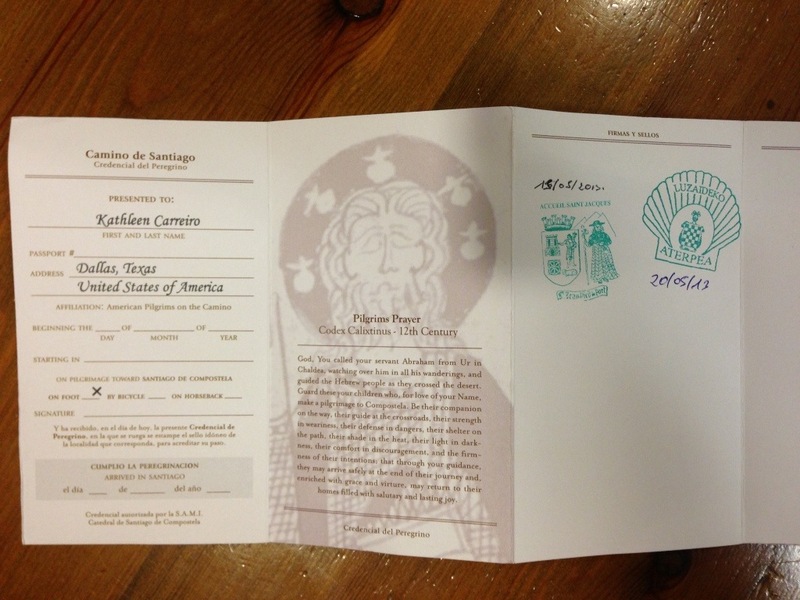 We now have two sellos (stamps) in our Camino Passport. 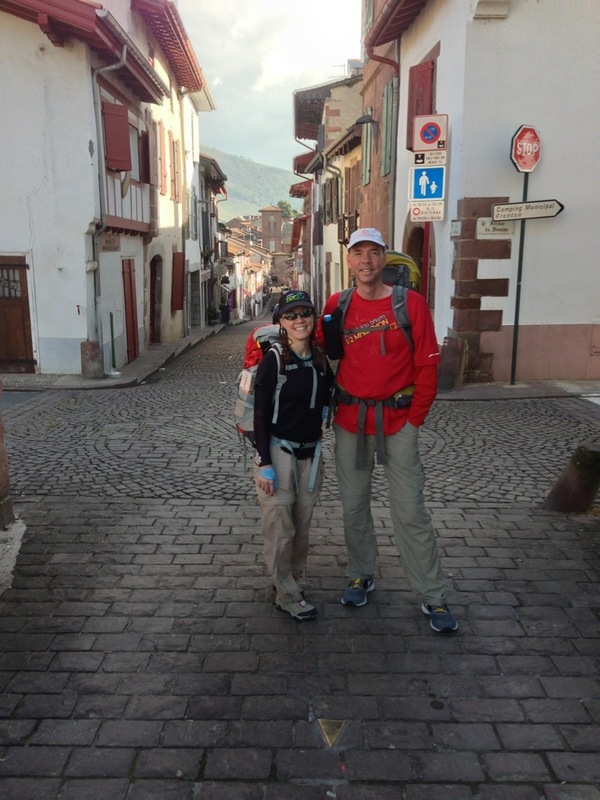 We’ll show them to the official Pilgrims’ Office in Santiago one day when we finally finish the whole thing, to get our Compostellas — the document in Latin or Spanish saying we completed the Camino. 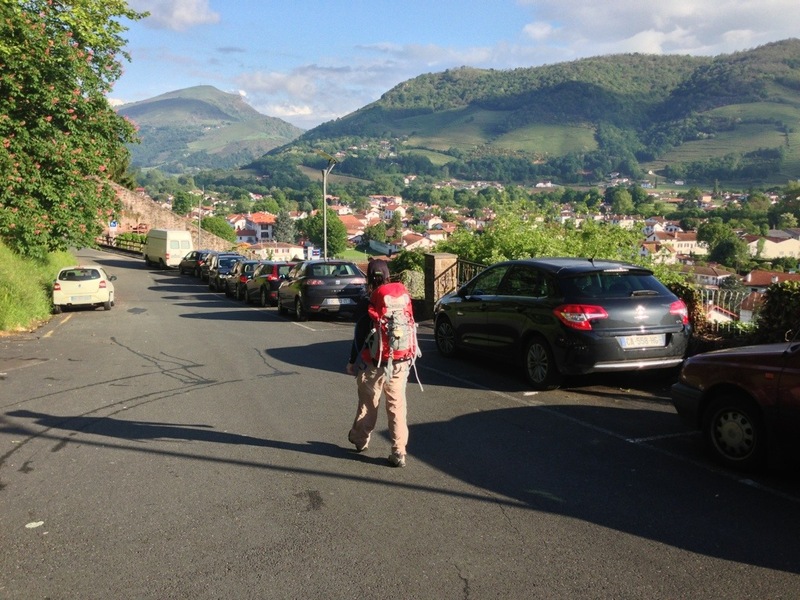 Tomorrow we do the second half of the trek over the Pyrenees mountains, and the last part of it includes a very steep uphill section as we come in to Roncesvalles, where we’ll stay the night. 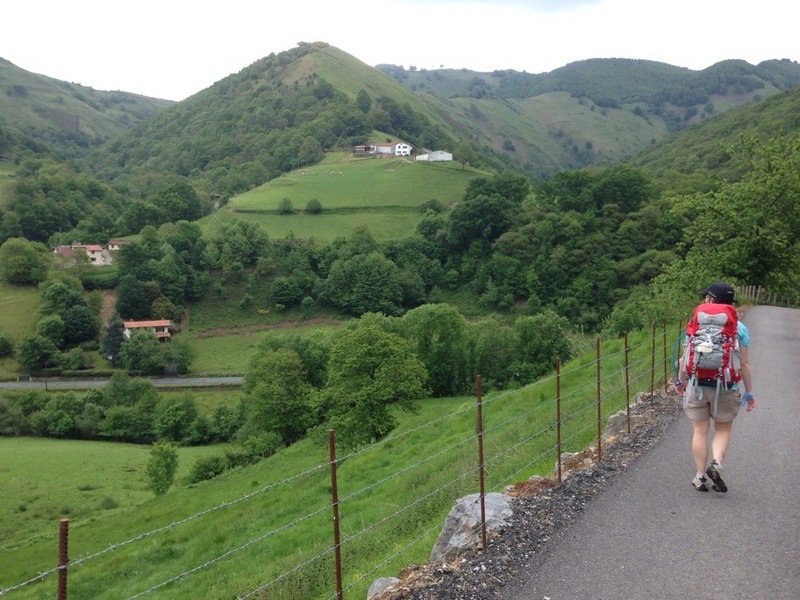 We’ll probably start seeing a lot more people there, since the Spanish tend to start there instead of in France, and they make up about half the pilgrims on this Camino — also because some people do these first two stages all in one long day. 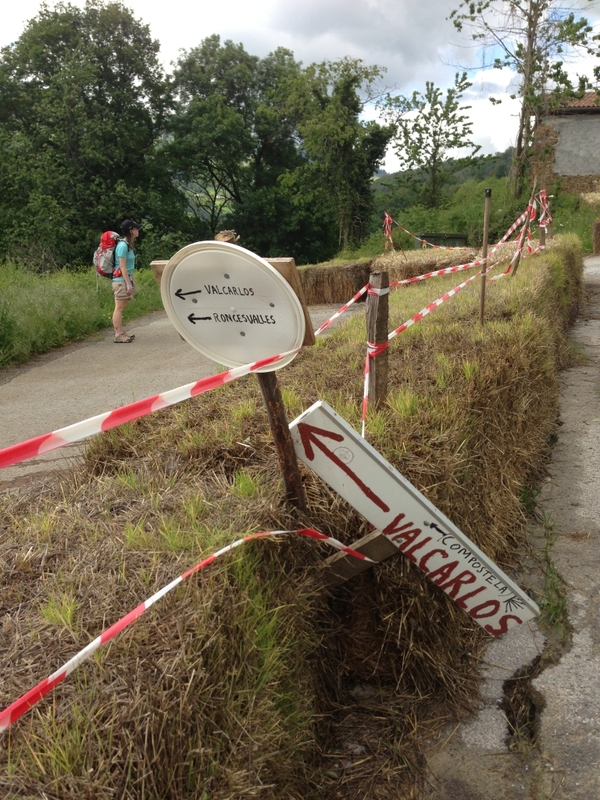 We decided not to push things since we knew we’d have a bit of jetlag, and I’m really glad we did it this way — Valcarlos is the perfect half-way point. Just beautiful! So glad all is going well. Happy Hiking! I did all my blogging on an iPhone 5, and I’ll be doing the same this year as well. There were times when a larger screen would’ve been nice, but I couldn’t justify the extra weight, and I don’t really think it would’ve made all that much difference. Plus the fact that I already knew I wanted to take my phone, so taking a tablet as well would’ve meant taking two devices, which was even harder to justify. I did quite a lot of writing and I was fine doing it all with one finger, even though it sounds difficult. My advice would be to thoroughly test out whatever phone and blogging app you decide to go with, and make sure whatever size photos you post show up correctly when you view them on a desktop computer. I used the WordPress iPhone app since that’s what my blog is on. 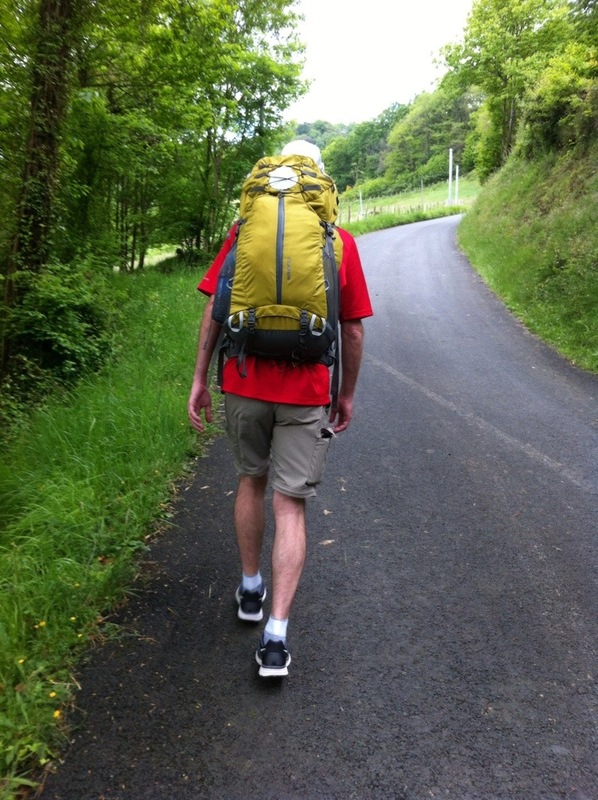 Once you have your routine figured out, there won’t be any problems or questions on the Camino, and you can just focus on writing. Thank you for documenting your trip! I am bringing my 2 daughters and 3 grandchildren on this walk to raise money for R-Charity Ranch for special needs families, veterans & saving animals. I am on a tight budget and am looking for free hostels if possible. Any suggestions? Hello, Can you tell me how steep VERY steep is? We live in Colorado and do a lot of hiking which, of course, includes some steeps. Also, do you mean hours of steep, or now and then short steeps? We are 79 and 76 and in good condition, very active, skiers, etc. 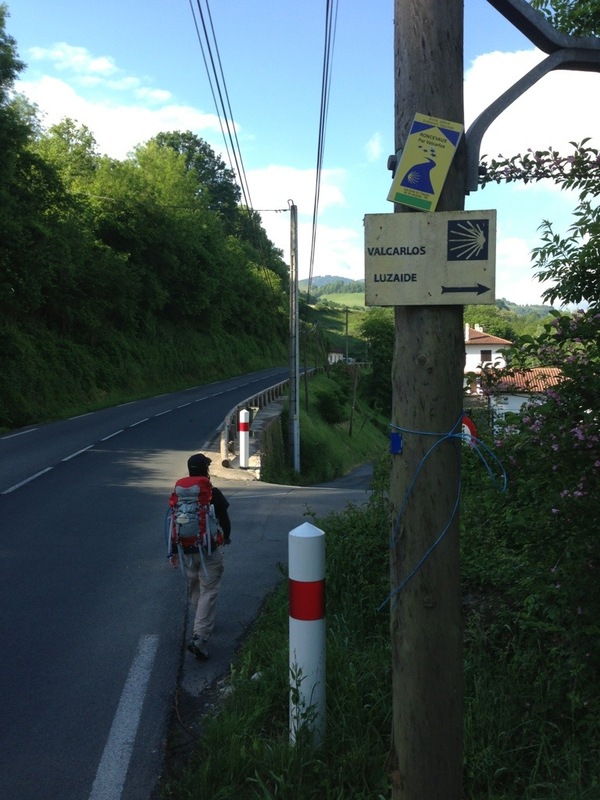 We’re done the Camino section from Sarria to Santiago. 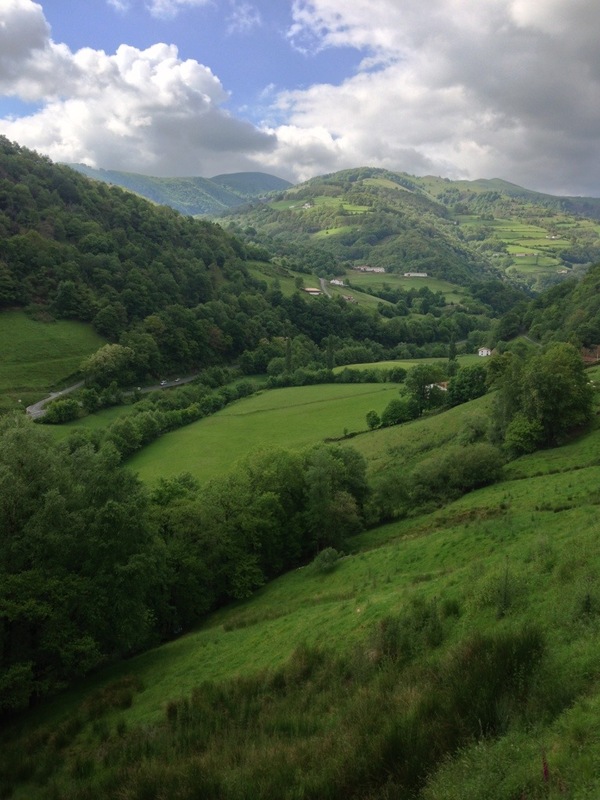 Would like to go again, in May, starting in St. Jean Pied, but frankly, not so sure about doing long steeps. Just not as enjoyable any more!